We're pleased to contribute to Sydenhams Arts' fantastic kilometer of children's books - stretching from Kirkdale Bookshop to Sydenham Community Library - March 8th 2015. Well worth a visit with the kids! The Lifeboat Read and Spell Scheme launched - literally - 15 years ago! First complete set shipped down the Thames to Lambeth on 'Gallichan' for pupils at Walnut Tree Walk Primary in Kennington. 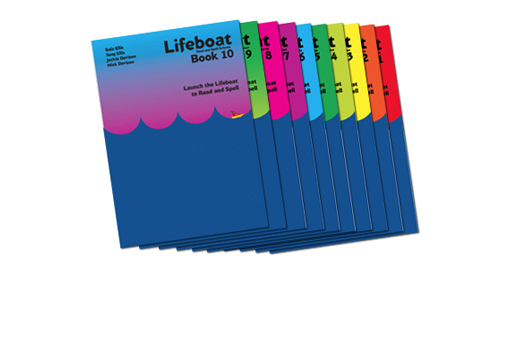 The authors' lifeboat Gallichan delivers the Lifeboat Scheme - helping dyslexic (and many other) pupils overcome their reading difficulties. The next Drama Workshop has arrived, based on the Robinswood High Interest Teenage Series novel 'The Bully'. The Workshop provides a way in to the story through straightforward improvisations that can be managed by Assistant Teacher, SENCo, or Class Teacher. The use of the Workshop, though, extends beyond just helping the reluctant reader to read the book: it's also a thought-provoking way into the subject as a whole. And, for now, it's FREE! So, what happened to Bruno? 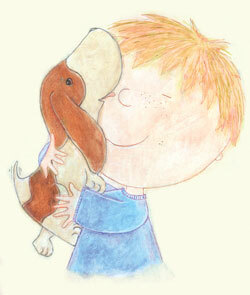 That 'very clever basset hound'? Wonderful stories. Great original illustrations. But nothing new for years? Well, Robinswood announces today that Bruno will be back - maybe even for Christmas 2014! More new Bruno stories. Wicked. OK. Monday: Brand new web-day! Look, Robinswood is a tiny, independent, family-owned publisher, so we can do things how we like, sort of - so long, of course, as we satisy our readers. We thought we'd keep things simple by outsourcing lots of stuff: distribution, web-site, print-buying, product development, admin... everything, almost. But, guess what, that actually made everything more difficult, more inflexible, more messy and - in the end - just much less simple! So, we brought it all back in-house. And the last bit is our web-site, internally managed and launched today. It's not yet as jazzy as it could be, but it works very well and can now evolve easily and organically as we wish, as new products and new ideas emerge. So, we'd say to other small bis: "If there's anything really original and unique about what you do, think hard before you outsource too much of your business - there's a point where a small, holistic enterprise can be sapped too far."